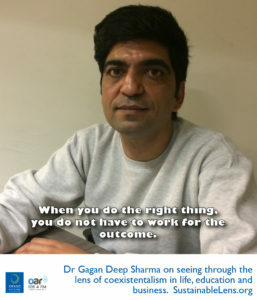 Dr. Gagan Deep Sharma is from the School of Management Studies at the Guru Gobind Singh Indraprastha University, New Delhi. He works and teaches in finance. with a focus on sustainable investment, humane business, and the response of technical education to sustainability. Sam: Welcome to Sustainable Lens, Resilience on Radio, a weekly show on sustainability topics brought to you by Otago Polytechnic. Each week we talk with somebody building a positive future and we try to investigate what drives them, what is their sustainable lens, how they’re acting as a sustainable practitioner. Today’s sustainable lens is that of Dr. Gagan Deep Sharma from the School of Management Studies at the Guru Gobind Singh Indraprastha University, New Delhi. He works and teaches in finance and he’s working in sustainable investment, humane business, the response of technical education to sustainability, and so on, all particularly with an Indian context. Thank you very much for joining me. Sam: Let’s start with the big questions though. Where did you grow up? Gagan: Oh well, I come from the province of Punjab in the northern part of India. I come from a small village, I was born in that small village, Rampur. I took my initial education from there and grew up there to a middle class family, service family. Yeah, just like that. Then I took my higher education from the same district. Sam: What did you want to be when you grew up? Gagan: Well, it was different when I initially thought. I thought I would be studying law probably. But, as I grew up, I thought that law is not my cup of tea, so I thought I’d rather go with teaching, and I ended up teaching. Sam: What did you do your higher degrees on? Gagan: I did my masters in commerce and philosophy. Punjab University is my university. Punjab University is one of the better universities, better known universities in India, and globally also. Then I did my doctorate in the field of management. I did it on the stock markets of South Asian nations. Yeah, so I studied the linkages between the stock markets of SAARC, South Asian regional block that we have. Sam: The sustainable, environmental, social thing that you have going now. Has that always been a thing for you? Gagan: Actually, it has not always been, but let me bring into perspective the other part. I started reading a lot of literature, not only on my field, not only on management, finance, and stuff, but I started reading literature on different fields like, for example, poetry. For example, on the short studies, the novels, the fiction, the prose, all of it. While going through that, I myself developed the interest to go into the poetry. So I wrote two books of poetry, which were in my local language, Punjabi. When I saw the field of finance and management from a poet’s view, that was a different lens altogether. That gave me a broader thinking, broader way to look at the things. I thought that finance, management, all these things, economics, by itself cannot be looked at in isolation from the other things of the world. This is where the initial change in my focus comes. The answer from within myself came, “No.” Then I thought it’s never too late to start thinking on the right lines, so I thought I’ll just look at the world of business, the world of management, the world of economics from the angle of a holistic perspective. This is the second way, the second shift that happens in my thinking philosophy. So from then on I shifted. As I said, I did my doctorate in global finance. All the doctorates that I’m guiding now are not in global finance. Those are in integrating finance with a holistic development, or sustainable development as you may call it. Sam: If you had had that lens earlier, would you have not done that doctorate? Or could you have applied that lens to the doctorate that you did? Gagan: Yeah, actually. Again, I did my post-graduation in 2001 and I started my doctorate in 2008. Had I had that lens before, I think I would have finished my doctorate by 2008 rather than starting it, because that lens does not hinder you, it helps. The biggest problem in the doctorate research is to find a problem, which problem to research on. Had I had that lens before, I think I would have had the problem before I could be able to identify the problem, well before. And I would have finished my work and then I would have been better placed to … I think would have been at a more advanced stage in my research on humane model than what I am today. Sam: So this workshop that was transformational for you, it was on human values and ethics. What prompted you to go to that? Gagan: Oh, it’s not so formal, but yeah. My university, probably I’ll put it in a very funny way, that two of us who were pretty naughty kind of. I was heading the department there, so my principal wanted to punish me. So he sent me for eight-day workshop. He said, “You should go there.” So I didn’t even look at the curriculum, what are they doing. I just thought that it’s a different place, so I’ll go, I’ll have fun. The other friend of mine, we thought that we’ll have some wine together and then enjoy the evenings. We won’t go to the workshop, as such. We’ll go on the first day and we’ll go on the last day. We were suited, booted. We wore our ties, we wore our suits. We were on the seventh heaven. Sam: What did they say in that first hour that got you to stay? Gagan: Oh yeah. Actually, it was a very planned workshop. They had the plan to trap people like me. The plan was such that, initially, they got some people who came and spoke for two to five minutes. They were the people like me who were trapped before. They were sharing their own experiences, that “This is how we came. This was the philosophy with which, and all the thinking with which we came. And then we came here for an hour and then stayed for eight-odd days.” There were people who said that, for example, there was a guy who had worked in Septem used to be a real big company. He was a vice president there. He was wearing a kurta and a typical Indian dress. That guy was talking that “I left my job of vice president Septem. Another guy said that “I left my job, IBM, a very high position, and I started doing this.” That got us. We thought that “Let’s listen to everybody. This is not this place to run away, so.” Before I spoke to my friend about my intentions not to leave, he spoke to me and said that “Look here, I’m gonna be here.” So that’s it. Sam: You said that was run by an electronics engineer? Sam: That seems a bit surprising too. Gagan: Oh yeah, oh yeah. I’ll talk about it in slight more detail. That electronics engineer, he was dressed in a kurta, white coloured. He seemed to be an ordinary man, I mean really ordinary man, because it is Uttar Pradesh in which this workshop was. Uttar Pradesh is the name of the province. I thought that “He is such a layman now. What can he teach me?” When they read his degrees while introducing him, they said that there is no book in the library of the university, IIT, that he has not read. Every book in the library at that time has been seen issued to Ganesh Bagaria. He has been going through the philosophy which we call as coexistentialism. This philosophy is called as coexistentialism. He has been into the philosophy of coexistentialism for long. You saw my presentation yesterday. I quoted A. Nagraj a number of times. A. Nagraj is the man who actually gave this philosophy. He went into the stage of samadhi in ancient Indian system. There is a stage of samadhi where you just get relieved of everything else that’s happening. He went into the Himalayas and did the samadhi for years. After coming back he didn’t speak anything at all for years. Because he got realised to the coexistence. This is what he writes in his books. Then he wrote 13-odd books of philosophy. If I tell you the ideas of those philosophical verses, he wrote on human behaviour, he wrote on economics, he wrote on science. I mean whatnot, law? Whatnot, constitution? He wrote all those philosophical books, 12-odd books. Ganesh, he read all those books. And not only that, all those books, he was in close company, he came across A. Nagraj like I did with Ganesh. He spent a lot of time and then discussed all those things with him. And he started looking at electronics engineering, or for that matter engineering, from that lens. That’s how he got into it, but yeah, I got into it like this. Sam: So we don’t have eight days, but can you give us an insight into what the philosophy is? Gagan: Oh, okay, why not? About eight days first. It is not necessarily eight days. The workshop is done for one day, for two day. I myself ran these workshops later for two days and three days for my students. Then it is also run for eight days, but as I said, in my feedback … We don’t call it feedback, we call it self-evaluation, which we do on the eighth day, on the last day. What I said in the self-evaluation was that I am afraid that this workshop was not eight day workshop. I’m afraid that this workshop is going to be running within me forever now. Eight days, you’re right you said you don’t have eight days, but I’m sure you have life. Not only you, but the listeners also. What is it all about? It talks about the four levels. It says that, initially, it begins with what is the goal of the human? What is your goal, right? We keep on saying that, for example, my goal is say social benefit. People say my goal is natural benefit, this this this this this. The workshop takes you to the straight white, that through all that, you’re actually not looking at all that. Those are the means to an end, and the end is your own happiness. The ultimate goal the workshop proposes, it’s run in the form of a proposal, not in any form of sermons. Not any form of verdict. It is run in the form of a proposal. It proposes that the goal of a human is continuous happiness. That’s it. I want to be happy and I want to be continually happy, that is it, nothing more, but nothing less. Then, for achieving the continuous happiness, it talks about the human programme. What is the programme that you have to achieve that continuous happiness? About the programme, it states that there are two important things in this whole universe. One is the human. Second is rest of the nature, right? Rest of the nature can also be classified into three orders. One is material order, plant order, animal order. And the fourth one, as I said, is human, so human order. There are four orders in this world. Material order, plant order, animal order, and human order. Then the first three can be put into the head of rest of the nature, and the fourth can be put as a human. So human and rest of the nature. For carrying out your programme, for reaching your goal of happiness, the human needs to be in harmony with the other humans, this is what we call relations, and with the rest of the nature from which we take the physical facilities. In order to achieve the human goal, the three things that human needs to do is … number two and number three, I’ll come to that first. Number two is relations with the humans. Number three is physical facilities with the rest of the nature. And number one is right understanding about both of them. How much is required, how to get it, all of that. It is about understanding about these two. In this way, this is the kind of human programme that is required to attain that human goal. This is the first thing. This is to happen within yourself. At the level of individual this is to happen, this understand is to happen, and then you are to realise that “Yeah, this is what I’m gonna do.” This process begins. Once this happens with an individual, the second thing which the workshop proposes is that it happens in the family. At the level of individual, as I said, at the level of self, what we call, it is continuous happiness. At the level of family, so once this happens within the individual, within all the members of the family, when the family is prosperous … And I have developed my own definition of prosperity where we say that what you have upon what you need. What you have upon what you need. Prosperity has to do more with the denominator than the numerator. While we are working towards what you have, have more, have more, have more whatever you have. And if you do not know exactly what you need, then the glass will never be full. If I remove the base of this glass it’ll never be full. Things are like this only. Therefore, in the family, it tells you about the denominator also. It guides you towards the denominator. What exactly do you need? And what exactly do you need is in terms of both second and third, relation and facility. It is not only about the facility, but also about the relation. When we do it this way, then the family has a possibility to be prosperous. And when the families are prosperous, then the third goal at the level of society is fearlessness. Since when we are not prosperous, we will try to grab it from elsewhere. In poetry, I say usually that when one gets frustrated, one will choose the weapon. And with the weapon, the one who is weak will kill himself and the one who is slightly stronger will kill the other. Both of them are dangerous for the society. And both of them are achieved only when we are, not prosperous, but when we do not have the feeling of prosperity for that matter. When the feeling of prosperity is there within the families in the society, there is a possibility of fearlessness, which I think is a goal at the level of society. And when you are fearless at the level of the society, when you know that you’re prosperous. You do not have to exploit the nature for attaining your own goals. For example, let me bring into perspective the example of my own province, where in order to … Because we people, the farmers in my area, we did not have a sense of how much exactly do we need. So we went for chemical farming and we have ended up damaging the air, we have ended up damaging the water, we have damaged the quality of land, we have damaged the quality of human beings because we are using that much chemicals. Reason? We did not know exactly where to stop. How much do we want to earn? We did not know what we need, so put infinity as a denominator, so the end result was zero. And as a result we kept on exploiting the nature. When we are in a position to attain the first three goals, at the level of individual, at the level of self, we are continuously happy. At the level of family, that we are prosperous. At the level of society we are fearless. Then at the level of nature, we will live with mutual fulfilment. We will fulfil. Just in order to, I’ll take a minute, I know that I’m going a little in too much of detail, but this is eight-day thing that I’m talking about and giving eight minutes is fine I guess. When we look at the four orders that I spoke to you about, material, plant, animal, and human. We look at these four orders. The first three orders cannot think. The fourth one can. Out of material, plant, and animal, these three cannot think. Arguably third can think or may not think, this is arguable, but the first two certainly cannot. Fourth can. And if we look at the damage that has been caused to the nature, the first three are very certain. The fourth is uncertain. If we look at the first three, material, plant, animal, plant knows what to breathe in and what to breathe out. Human body also knows. But the plant also knows what to do, where to grow up. It has a certain behaviour. If I throw this glass from up side, it’ll go down, that’s it, right? There’s no uncertainty in it. If I crush it, it’ll be crushed. If it is strong then it’ll probably crush my hand. The first three are certain behaviours. The fourth does not demonstrate a certain behaviour. And all the damage that has been done to the nature has been done by the fourth. It is important for us not to manage the other things. We are too busy managing material, we are too busy managing plants, animals, all those things. Without feeling the need to manage ourselves, to think within ourselves and understand that it is the human which needs to be corrected, nothing else. This is almost all that the workshop speaks about. As I said, this is in the form of a proposal which one can verify at one’s own level. The good thing about this kind of a workshop is that now, we started small. Those people started very small. Now they are multinational also. We are holding these kind of workshops overseas also. Some workshops have been had in South Asia. We are planning to expand overseas also. These kind of things, wherever required will be done. This is not done for the sake of material. This is not done for the sake of money, no money is involved. Sam: When you, after eight days, went back to work and you went away as somebody that was all into high finance and you went back, what did you say? Gagan: Oh, I did not say anything, I did. Two of the important things that I could do … Rather, three of the important things that I could do. I was too much into research. There were 23 students who were studying in the MBA programme, I was heading the programme department, I was head of the faculty there. I called my staff and told them that “Guys, look here. We are not going to do anything which does not have a purpose.” So all the research, those 23 guys, our students, they were supposed to write a project each. We told them that “Okay, all those 23 projects will be with a goal. And they have to be placed somewhere within this.” I handled it myself and looked at all the 23 topics myself and made sure that those are somewhat related and somewhat placed within this framework. Then we went ahead and did those projects, 23 projects. Okay, now, this is one. I’ll talk about the outcome also. The second important thing was that, since I was heading the faculty, I was also to look after the industry placement of those students. I must admit that this was the first batch of MBA holder, and the placement scenario was not too good. Employability scenario, not many companies are coming to employ those people. So when we did this exercise of 23 people doing their own projects on some meaningful issues, I requested my principal who punished me to come out to give me some funds, and I want to publish a book of the summaries of those 23 projects. I wanted the students to come up with the research papers out of those 23. I submitted all those 23 papers into SSRM, which is a social science research network, and got those published there. Sanjit is one of my students, but he’s a friend and he was a colleague there, so I got him to do all those things, and he did. He also attended a workshop by the way, and is doing a PhD under me on similar topic. I wanted him to look at these 23 papers and then we submitted it to the network, and then we got it published in the form of a book. Then I sent those books to almost all the industry that was around. To all those companies, with a sworn letter from my end, that “This is what our students have done. I’m sure you’ll look for the right tenant. And I think you can evaluate these people on the basis of that tenant.” So we did that, and what happened next is anybody’s guess. All those 23 people got their own offers, didn’t they? This is how I propose that, when you do the right thing, you do not have to work for the outcome. You work on the input and the outcome follows. This was pretty strange, and after that I’ve never looked back. I’ve thought earlier, I was also thinking that I would have to work for these people’s industrial placements separately, I will work for the research separately, I will work for the academics separately. But then when I realised that this is what, this. This isn’t about this part, but I would again put into perspective one more thing. The other thing that we did was that, both of us who were there at the workshop, we thought that “Once we have some more understanding about it …” So we attended two, three, four more eight day workshops. This time we requested the principal to punish us again. We attended three, four more workshops, and then we maybe thought that there is somewhat clarity about it. We started with a smaller version of it, one day, two day workshop for all the university students at our campus itself. I said, “That’s true, but what can we do in it?” They said, “You talked about society in that workshop. We want to begin with an evening school for those workshops, and whichever student is free will go and teach.” I said, “That’s, wow …” I said, “I do not, there’s nothing stopping, so let’s go on.” We started with it. We gave it a go-ahead and the students started with it by themselves. We gave it a name, called Prayas. Prayas is effort. Hindi version of effort is Prayas. So we said, “Okay, let’s do it.” We started with it, we did it, and while doing this thing, I was also looking at the PR part of my college, public relations. Some of my friends who were in the media, journalism and media, they came to me and asked me, “Sir, give us some story. Not news, but some story.” I said, “Okay, fine, I’ll give you one story.” So I got them to interview those students who did that. They did a story, it was a national story, it got published. Sam: Because it’s the right thing to do. Gagan: Yeah, it was the right thing to do, so we did it. And then the government wrote to us that “We would like to adopt this as a school,” which my principal denied. He said, “No, I do not want the government to do it. I will continue doing it. I will have my people continue doing it because the people can do more than the government can.” These are a few of the things that did follow the workshop. Sam: Just in terms of the framework, the self, family, society, nature … The first one, the continuous happiness self one, is that different to the satisfying rational man generating selfish happiness that you would’ve come across in the finance and the stock markets and things? Is that a different concept or is it the same thing? Gagan: No, it is different. Well, we need to classify in that, individual, you need to classify human into a coexistence of body and self. There is nothing religious in it, there is nothing spiritual in it. But scientifically, there is a thinking pattern within us which can be called self or conscious, and then there is a material component, which is the body. Body, again, acts certainly, with certainty. If you hit like this, it’ll pain. Self is the one which is conscious. So between body and self, and there are needs of the body and needs of the self. Needs of the body are limited, certain. And the needs of the self are different. When you look at the facilities, facilities are required by the body. For example, there is extent, there is a limit to how much you can eat. The body cannot tolerate, we cannot keep on eating, eating, eating, eating, eating. But the self feels, I should eat more, I should eat more. It is the self. Your stomach is full, but your mind still feels, “Yeah, more.” That feeling of more, wanting to have more, is there in the relation of man. Right, so-called relation of man. But when you look at the things from this lens, suddenly you realise that there is extent, we have to be actually relational. In that way, classifying it into body and self is what is different in this theory. In the typical theories, we only look at human, I think most of us we look at human as body. When we call ourselves selfish, there is no self-involved. It is bodyish, not selfish. I myself often say that being selfish is the best thing to happen. If you know what is in interest of yourself, that’s fine, that’s perfect, then the goal achieved. Sam: So when you apply that lens to technical education, and you’re looking at a school of management or electrical engineering or whatever else it might be, what does this lens offer to how we develop that education? Gagan: Firstly, I’ll slightly modify the question and then answer it. Rather then, remove the word technical and let’s apply it to education, and then let’s come over to technical education in the second stage. Education will give us the right understanding, which I spoke about, about the relations, about the facilities. What do we require? What does a human require and how do we get that? Two things, what and how. What to do and how to do. “What to do” is value and “how to do” is skill. There are two types of education. Value education is the one that deals with what to do question. And the technical education is the one that deals with how to do question. No kind of technical education, or value education, can be enough in isolation. It has to be looked at in an integrated fashion. “What to do” needs to be addressed first, even for the technical education students. Even for the technical students, like we spoke about the electronics engineer, and myself for management, professional student of management, student of finance and economics. What to do needs to be addressed first and then we need to address the how to do part. You cannot take for granted that these are the skillsets to be developed. We only need to look at the need, that what exactly do we need? What kind of skills do we need? Why do we need that? What is the placement of those skills in the entire system? And then we impart those skills. The technical education, now coming to the part of technical education, needs to look at what exactly is the technicality that we need to impart to our students. Once we did valuable to do that, then we should think of ways and means to impart that. For example, as a school can representation also yesterday, we need management graduates. But do we need management graduates only to solve the multinationals? Only to solve the companies like, for example, you look at the telecom companies, you look at the e-tailing, retailing companies. Do we only need the management graduates to sell their products? Or can the management graduates also look at the problem of the India? For example, I take the case of India. The problem is that we do not produce what we should produce. We are producing what we should not. We are producing through chemical methods and we do not produce through natural method. Once we are able to reach to the farming community, then the management graduates can make groups out of them and get to know exactly what to produce from the market area, from the sense of the market, and then act as a bridge between these two. Engineers can further help, electronics engineers can further help through agri electronics, through concepts such as green engineering and all those things, as to get the maximum out of the system that we already have. The management graduates on the other hand can also tie up with the bigger chains like Walmart, with the bigger chains, and then supply to them the natural product, which you and me and all in India, all of us in India, we are just ready to pay any price for it, provided we get the right quality of food. If this can happen, there’s a very simple solution through which we can not only do good in terms of facilities, because we don’t only require more food in that terms, we also require the right food. The right product is also important, the quality of the product is also important. Going by that, I think this will solve the facilities in a good way, and we will be able to maintain the relations with the human order and with the rest of the natures. In this way, technical education has to fit in this system. Sam: Is this a lens that is universally applicable? Can you point this lens at anything? Gagan: Oh yeah, why not? Why not? It is only about understanding the lens first. It is not a material lens that you can just see through. It has to happen within yourself. You’ll have to realise the real things, and then only this happens. Sam: You study humane business, which could be seen as a contradiction, if you’re managing a business in terms of maximising return, but I think you’ve just answered it in that it’s not … That question is too far down the track. You would see the question being asked much earlier, I suspect. Gagan: More, I think, this is okay. Actually, Sam, I’m coming up with a model, I’m doing a research myself on the humane business, so I’m soon going to come up with a model of humane business. Maximising return, I put it the other way. The concept that I am giving is holistic value. We have talked about three things previously in economic literature. We have spoken about wealth, we have spoken about profit, we have spoken about value, and we’ve also spoken about return. What business generates, for me, is holistic value. As I said, if you’re able to generate the holistic value, your product sells itself. For example, we spoke about the natural business example. I do not have to hire a Bollywood star to sell my natural product. I don’t have to pay to him for all that. I simply have to tell my people that this is what is good for your health. And not only tell them, I have to make them realise this. Once that happens, once they’re educated, so it is not marketing, it is education. Once those people, my consuming class is educated about it, your product sells itself. This is where I say that this business is not against the notion of profit. This is for the notion of profit. But profit is a term which we only used towards the stakeholders and that also for the share owners, just for the share owners. If we look at all the stakeholders, who are those stakeholders? All of them? Again, we put it in another way that the stakeholders will include the individuals, it will include the families, it will include the society, and it’ll include the nature. In the individuals it’ll include employees, it’ll include the consumers, it’ll include your share owners, your investors, and the ones who are not connected with you directly. All of them. When you do the right thing, it’ll generate return for all of them. I think that’s more important. Profit? We are not leaving aside the profit. We’re including the profit within it. I’ll take a very small example in a minute. There are millions of farmers in India who are producing, and they’re dependent upon the government to buy their produce. The government in India, I’m not sure if you know about it and your listeners know about it. The government in India comes up with a minimum support price for agricultural produce every year, MSP. The farmers sell their produce at that MSP, minimum support price. Then I asked, “Why?” He said, “Sir, my produce comes in April, but I only take orders till May previous. So anyone who gives me order till May 2016 will be given the produce in April 2017.” Ooh, one year waiting. This is how the produce sells itself. Mind you, this produce sells at more than twice the cost. More than twice of the typical produce, which is a chemical produce. And he does not have to use any chemicals in the produce, so his cost also comes down after a few years. This is how. This generates profit. Will you say that this does not generate profit for him? But it also does generate profit or value for the consumer, because other consumers will eat the chemical produce and then they will attract problems, diseases. The land will be in a problem. The other produce, which Mr. Singh is producing, generates not only the profit for him, but the value for all of the four stakeholders. This is what is holistic value. Sam: So how does your framework relate to the notions of sustainability? Gagan: I’ve already explained to you what is this framework all about. Let’s revisit what is sustainability now. UNESCO says that “Sustainability involves not consuming what belongs to your future generations.” Nagraj says that “Sustainability is not only that …” I mean, he does not use the word sustainability as such, but in his view sustainability is not only this. You do what UNESCO has said while also adding value to the four levels. While also adding value to the human, to the individual, to the families, to the societies, and to the nature. In this way, the framework that we have discussed involves sustainability, but it involves more than that. Or it involves sustainability in a broader way. It does not look at sustainability only in terms of facilities. It also encompasses the relations between the humans or with the rest of the nature. And therefore, we do not go separately, for example, in one man, for society, for governance. We do what we are supposed to do, and everything else is outcome, is a byproduct. Sam: How would you describe your superpower? What are you bringing to the superhero team? Gagan: I’m simply bringing the kind of a need to think on what is required for yourself. Not just be preconditioned and thinking that I require a Nike t-shirt and that’s it. You need more. Not just what you’ll eat for breakfast, lunch, and dinner, but how will you live between breakfast and lunch? How will you live between lunch and dinner? How do you feel during that time? I’m bringing the need to understand: What exactly do you need? What exactly do you need when you reach that point? Then you need more for your family. What do you need for your family? What do you need for your society? What do you need for the nature? All this, and there is no conflict of interest between these four, right? Usually we presume that there is a conflict of interest between families, there is a conflict of interest between Sam and Gagan, for example. There is not, there is none. I’m bringing this coexistentialism into the perspective. This is not being superhero, this is just being human. There’s nothing like superhero. For example, I once asked Ganesh … We brought it into perspective, I asked him that “Sir, what is subconscious?” Said, “There’s so much thought about subconscious.” He said that “You better be conscious. So if you’re conscious, that’s it.” Similarly, someone asked him that “Do I need to meditate?” He said that “Once you realise what is to be done, once you realise all this.” So meditation goes on 24/7. If you are not to meditate separately, you exactly know what you are to do. Meditation is talking to yourself, knowing what yourself needs. If you know what yourself need through your conscious yourself, there is no need to be subconscious or unconscious of whatever. Sam: What’s the biggest success you’ve had in the last couple of years? Gagan: Well, Sam, a lot. On my family front? On my individual front? On the society front? On the nature front? I’ll talk about all of them in a minute. On my individual front I’m relaxed. For example, I know I’m earning enough. I’m not seeing a need to go for extra earnings. I don’t need to go for anything extra than that. I’m okay. This is for my individual front, and I’m happy. I do not have to worry for the things. I do not have to worry for my facilities, I do not have to worry for my relations, I’m okay. Things are fine. Things are going fine. I will not say I have achieved, but I am in the process at least. On the family front, which is the most important for modern man. I will give you two or three important things. My wife and I, we live together. My parents and my wife’s parents live in Punjab, which is a province 300 kilometres away from my place where I work, uni. We go to the families whenever we go to Punjab. We go to the families, we spend time with them, everything fine. When I was to come here, I did not have to worry about my wife being at home alone. There is so much bonding within the family that I’ve spoke about this and both the families offered, “We will come and stay with her.” My parents are staying with here. That’s the one part at the family level. I do not have any confusions, we do not have any questions. My wife had also gone to the workshops though. After the marriage she went to one, and one she had gone into before the marriage itself. Second important thing, which I think the most important thing. My father was diagnosed with a tumour a year and a half back. We thought that we would go through the allopathic treatments and all that. While I was going through the workshop and all, allopathy said that we will have to conduct a Whipple procedure, which is a medical procedure, which is a very lengthy procedure and a very complicated one. You have to remove some parts of the body and then … It’s a very complicated procedure. Very costly too, but cost didn’t ever matter much. Health mattered. We were prepared to go for the Whipple procedure. It was slightly malignant also, the tumour. We said, “Fine, this is nothing. Nothing much in it.” Just for six months, and this would’ve been in October, so this was pre-conference. He took those medicines for six months. Then I again spoke him that “Okay, this is what it is. What to do next?” He said that “Okay, as it’s your family, let’s go ahead and eat these medicines for three more months.” He kept taking the medicines for three more months. Then, after those three months, we went to him. He looked at, they would just touch from, they would just see the nose and then feel what exactly is the problem. They would not do any other diagnosis that just the nose. Then he checked it and he said, “I think the problem is gone. But, again, as I say for my family, let us eat it for two more months. Half for one month and then further half for the last month and then done.” I said, “Okay, fine,” so we did it. After 11 months we underwent all the tests, all the chemical tests, the CT scan, the 19.9 test, all the tumour tests, everything, and there is no tumour. Gagan: This is at that level of the family I think I could not achieved this for any other way. I think this means the most to me, and to you, and to all your listeners. And those guys did not charge anything. I would have paid millions of money and then still, I’m not sure if we could have cured. We would have harmed his body till that required to be opened up. And all the doctors were saying that “This is foolish. You should not do this. You should go for the procedure.” Then when the results came and the same doctor looks at the report and says, “There’s not any tumour. Gone.” This is at the level of the family that I have achieved. That I can relax and I need not to think much about the physical problems that we come across or we may come across in the times to come. And I do not need money for it, I need relations. At the level of society, I think I’m doing something worthwhile. I’m in the process of doing something worthwhile. I’m guiding two, three PhDs which are on this line. In the times to come, I’m going to come up with a model, as I said, humane model of business, which I think will go a long way in the business due to the right thing. That is what will happen at the level of society. It is already in the process of happening. I also know more about how to manage my team because I can understand. I understand myself as a human, so I understand others also as humans. It is easy for me to manage the teams. For the nature? All this is nature. For the nature, you do not have to plant trees, right? There are many people who plant trees. You only have to not to disturb it. That is the biggest thing that you do. You don’t have to disturb the nature, nature will take care of itself. In that way, I think I have achieved these kind of things at all the four levels, yeah. Sam: Do you consider yourself to be an activist? Gagan: Yeah, I’m an activist because I work on myself, that’s it. Working hard on yourselves is an activism by itself. If you work on yourselves and the people can see you, this is what you are doing. The people who are close to you, they understand this is what he is doing and he is able to achieve some results. This transforms them also. This generates the eagerness to understand what you have understood, or what you’re starting to understand. In that way, I believe that activism is not much about showing what will … It’s not much about showing, but it’s more about doing on yourselves. I come from kind of a family of activists. My grandpa was an activist, my maternal grandpa. He was an activist, he was a union leader. My father has been fighting all his life for the literary causes. I also kind of used to think that I’ll be a reactive activist, but then I realised that activism is more about this, rather than what I used to think before. Sam: What motivates you? What gets you out of bed in the morning? Gagan: Usually I just get out of bed and do some work for my family. For example, I go to the kitchen straight away and then get some water. I’m used to taking some hot water with some lemon and ginger and honey. That’s my first thing in the morning. That I do not only for myself, but also for my wife. I come from a society which is different. The wives do everything. This is something which I do. Then of course there are certain things, cooking, I do not know much about it, so she does it. It’s not that it’s only her who’s doing all this. Sam: What challenges are you looking forward to in the next couple of years? Gagan: Well, we have different challenges Sam. Actually, capitalism has 20 different set of challenges at us. I spoke about working on yourself, but the whole world is hell bent upon work letting you work on yourselves. For example, I thought of … the title of my second book of poetry was Man is Never Alone. So I say this in a different perspective, and you can sense your answer out of that, that the whole world is hell bent on making people alone. For example, the selfies, right? You don’t even have to rely upon others to take your photo. You can yourselves as selfies. You do not have to do anything, you just sit in a room then do all the communication by yourselves. While you and I are sitting here, we could have sat here and work on our computers or on our mobiles and communicated to the rest of the world without feeling the need to communicate with each other. The whole world is hell bent upon making people feel isolated. And isolated, but busy. But man can never be isolated. This is the challenge, the biggest challenge is that it is very difficult to realise that they need to think about themselves also. They will think about material, they will think about plants, they will think about animals, they will think about the body, but not the self. The biggest challenge is that capitalism is trying its best not to let this happen. So how will we make it happen? You create a challenge. I’m sure, once we are able to talk to the people and once we are able to demonstrate what is right, rather than preach what is right, the challenge will be met. Sam: Two more questions. If you could wave a magic wand and have a miracle occur tomorrow morning, what would it be? Sam: That’s an easy one. And lastly, do you have any advice for our listeners? Gagan: Well, yeah. Your listeners should not only listen to the show, they should also listen to themself. Listen to what are their needs in terms of relations and facilities. Then read the proposal that I spoke about. Read a little bit more about the proposal that I spoke about. The website is coexistence.in. They can go there to the website, coexistence.in, and then read a bit about the proposal. And if they need to, I’m being all available to cater to them. As I said, there is no material involved, no money involved, nothing. We can simply speak about this and help them understand what theirself needs. Sam: Thank you very much for joining me. Gagan: Oh thank you. Thank you sir. Sam: You’ve been listening to Sustainable Lens, Resilience on Radio, a weekly show on sustainability topics brought to you by Otago Polytechnic. The show is co-hosted by Shane Gallagher and me, Samuel Mann. We broadcast on Otago Access Radio, oar.org.nz, and podcast on sustainablelens.org. That’s Sustainable Lens like a lens we’ve been talking about. On sustainablelens.org, we’re building up a searchable archive of conversations with people from many different fields who are applying their skills to a sustainable future. In our conversations, we try to find out what motivates them and what it means to see the world through a sustainable perspective, through their sustainable lens. Tonight’s sustainable lens was that of Gagan Deep Sharma from the Guru Gobind Singh Indraprastha University in New Delhi. He works in the School of Management Studies. You can follow the links on sustainablelens.org to find us on Facebook to keep in touch, and you can listen to Sustainable Lens via iTunes as well as all the other sort of pody places that you’d find that sort of thing. We’re everywhere. But do like us on Facebook. That was Sustainable Lens, I’m Samuel Mann. I hope you enjoyed the show. This conversation was recorded in December 2016 at the 5th International Conference on Sustainability, Technology and Education 2016.